After its debut this weekend in Japan, the race-ready ZEOD RC was put on a public race track for the first time during the FIA World Endurance Championship's Japanese round. The electric prototype race car is, Nissan says, ready for next year's runs on the FIA Le Mans 24 Hours circuit in Garage 56. During its unveiling in Japan this weekend, it proved that by getting on the track at the Fuji Speedway where the current Japanese leg of the FIA World Endurance Championship races are being held. The races, which were rain-curtailed and didn't happen over the weekend, but instead early this week, saw the ZEOD RC piloted by Michael Krumm, its current test driver and a former GT Academy champion, during exhibition runs around the track. The ZEOD RC was designed to run on electricity alone for an entire 8.5-mile lap at top speed (186 mph), the first vehicle to do so in Le Mans, and otherwise can run an entire race as a hybrid with brake regeneration recharging the batteries as it goes. 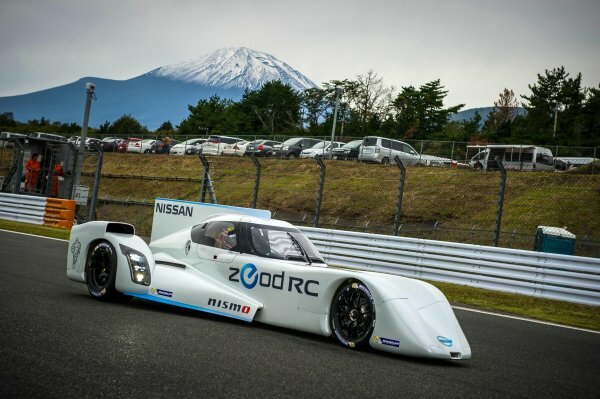 "This has been a fantastic opportunity for everyone involved to bring the Nissan ZEOD RC to Japan to present the car at Nismo and then show the car at Fuji Speedway for the fans," Nissan Global Motorsports Director, Darren Cox said. "The reaction from the fans has been amazing - especially the young fans. We had a very poignant moment watching the car on track with Mount Fuji in the background. We know we have a very big mountain to climb to develop this electric vehicle technology for Le Mans but seeing the reaction from the young fans is a key reason why we are doing this. "It was a pity that the weather spoiled the day on Sunday for the FIA WEC race but we were thrilled to be able to bring the car here for loyal Japanese fans." The car is now headed back to the United Kingdom for continued testing and development in preparation for the circuit next year. The Nissan ZEOD RC will be a part of Garage 56 during the 24 Hours of La Mans next year during the French endurance classic. Nissan plans to further the technology built into the ZEOD RC in its LM P1 assault program's future.